DRP houses sophisticated facilities for optical and electron microscopy. This is an EDS phase map of a concrete sea wall subjected to marine water attack and alkali-silica reaction. Petrography is a fundamental aspect of investigating deterioration from durability mechanisms such as alkali-silica reaction. Pictures really are worth thousands of words. The scanning electron microscope reveals secondary deposits in striking detail. 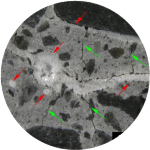 The most important aspect of petrography is understanding how it relates to the performance of the larger structure. Located in Boulder, Colorado, we use concrete petrography and other analytical methods to investigate concrete and other cement-based construction materials, natural rock products, and geological resources. With straightforward thinking, meticulous detail and impeccable customer service, we provide our clients the information they need to understand the performance of construction materials. Our roots in geology run deep and optical microscopes serve as the cornerstone of our practice. See how we shed light on understanding the nature of construction materials. 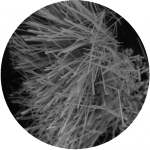 Electron microscopy offers the ability to obtain higher magnification, superior resolution, and in situ microanalysis. 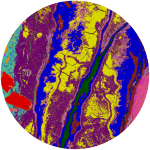 See how we can unlock the details of your materials’ microstructure. Thorough documentation and concise communication are essential. See more about the areas of DRP’s expertise and our proven track record of effective consultation.